Specialist Services Here to Help! Blocked Drains cleared fast. Blocked drains are potentially messy, disruptive, upsetting and at worst a health hazard. Attempting to free a well-blocked drain is no task for the DIY 'expert'. The good news is that help from Drains Are Us is only a telephone call away! Qualified and experienced staff assess the situation, provide a full quotation and when given the authority to proceed, work cleanly, quickly and efficiently to restore your services to you. We will solve any drainage problem, large or small. Our camera surveys often save the need for expensive excavation and the subsequent upheaval it can bring. We are one of a few companies able to provide this service, and our expertise in this area has gained us a lot of customers in both the public and private sectors. 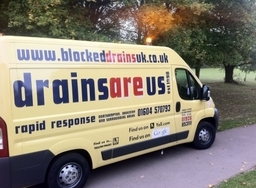 Drains Are Us is a local independent family company offering quality drainage services with a fair deal pricing structure. Established since 1998.